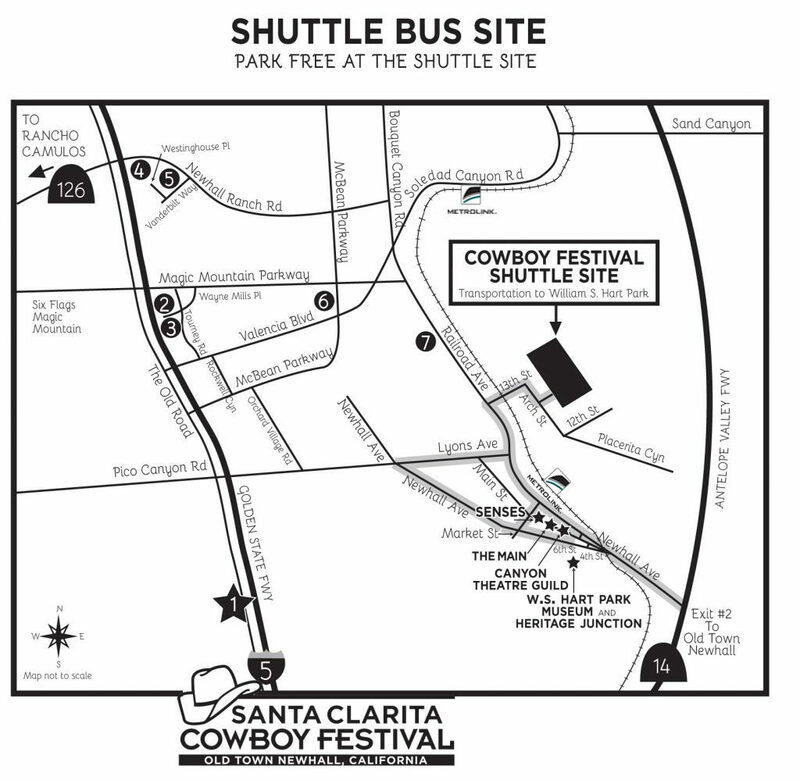 SANTA CLARITA COWBOY FESTIVAL 2019 ROAD CLOSURE AND PARKING DETAILS, APRIL 13 & 14. Santa Clarita, Calif. – The 26th annual Santa Clarita Cowboy Festival, presented by California Resources Corporation, returns to Old Town Newhall this weekend! Residents are encouraged to prepare for road closures in Old Town Newhall and plan transportation accordingly for Saturday, April 13 and Sunday, April 14. The 2019 Cowboy Festival, taking place at William S. Hart Park is expected to draw thousands of visitors to the area. Beginning Saturday, April 13, Newhall Avenue, from Market Street to 4th Street, will be closed for festival transportation and set up. Please plan a different route in advance of the closure, which will last from Saturday, April 13 at 6:00 a.m. to Sunday, April 14 at 9:00 p.m.
Free parking for the Cowboy Festival will again be offered in the dirt lot located at the bend of 13th Street and Arch Street in Newhall. Guests will be able to take a free shuttle to and from the parking lot. Please note that limited parking is also available in the City-owned parking structure on Main Street in Old Town Newhall, but shuttle service from the structure will not be available. No parking is available at Hart Park. The City greatly appreciates residents’ cooperation, and is working to make theSanta Clarita Cowboy Festival a great time for all! For more information regarding Cowboy Festival events, and to purchase tickets to special performances, please visit CowboyFestival.org. Previous PostCITY OF SANTA CLARITA THANKS LOCAL VOLUNTEERS DURING 2019 NATIONAL VOLUNTEER WEEK﻿Next PostTHE SANTA CLARITA EARTH ARBOR DAY FESTIVAL RETURNS APRIL 27, 2019 TO CENTRAL PARK .